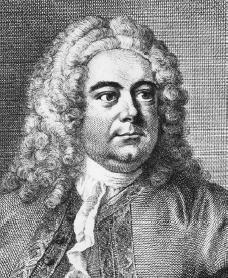 George Frideric Handel was born on February 23, 1685, to Georg and Dorothea Händel in Halle, Germany. To study music he had to overcome his father's objections, and at the same time follow his father's insistence that he study law. But even before Handel had finished his law courses, he was devoted to pursuing a musical career. Although his father would not even allow him to have a musical instrument of his own, he managed to find ways to practice secretly. At about the age of seven he performed at the keyboard before the duke and his court at Weissenfels, Germany. As a result he became the pupil of Friedrich Wilhelm Zacchow, a composer and organist. Zacchow taught him composition as well as the organ, the violin, and the oboe, and by 1695 Handel was composing for these and other instruments. From 1696 until 1701 Handel composed many works. Unfortunately, the church cantatas (music that is written for one or more singers) and all but a few pieces of chamber music (music that is meant to be performed in a small space) that he composed at the time have disappeared. Contact with German composer Georg Philipp Telemann, and a meeting shortly afterward with the composer Agostino Steffani, spurred Handel's operatic ambitions. In 1703 he resigned his post as organist at the Halle Domkirche and left the university, moving to Hamburg, where he joined the Goosemarket Theater as a violinist. But it was Handel's exceptional skill at the keyboard that brought him employment in the performance of operas. Handel began his own operatic career with Almira (1704), which ran for some twenty performances—a very successful run. After several more successes, he sought richer operatic experience and left for Italy in 1706. He visited Florence, Venice, Rome, and Naples during the next three seasons, meeting almost all of the notable Italian musicians. His Italian journey resulted in two fine operas, Rodrigo (1707) and Agrippina (1709), several dramatic chamber works, and equally dramatic sacred compositions. During a second visit to Venice, Handel met several persons interested in England who no doubt influenced his decision to try his luck as a freelance musician in London. A meeting with the manager of the King's Theatre furnished Handel with a chance to compose an opera. Within two weeks he produced the opera Rinaldo, which marked the high point of the London season in 1710 and 1711. Handel's course was set for the rest of his life. As London became Handel's permanent home, he proceeded to compose a large amount of music for harpsichord, chamber ensembles, and orchestra, as well as various works for royal occasions. Handel's compositions so impressed England's Queen Anne (1665–1714) that she awarded him an annual salary of two hundred pounds. After Anne's death, George I (1660–1727) became king of England. In 1715 Handel provided music for a royal pleasure cruise for the King, his mistresses, and several barge-loads of courtiers (members of the royal court)—the famous Water Music. In 1719 Handel accepted an invitation to join forces with the newly founded Royal Academy of Music. Handel's operas were numerous and well-received, but despite their success the academy did not prosper. In 1726 Handel became a citizen of England and was appointed composer of music to the Chapel Royal. The season of 1727 saw the production of Handel's Alessandro. This marked the beginning of an intense rivalry between Faustina Bordoni and Francesca Cuzzoni, two prima donnas (leading female opera singers) whose hostility greatly harmed the cause of Italian opera in London. Other factors no doubt lent weight to the growing public disappointment, but this single event seemed to have caused opposition to Italian opera in London and introduced a succession of developments that led to its fall. Apparently undismayed, Handel immediately formed the New Royal Academy of Music in partnership with a Swiss entrepreneur. After a whirlwind trip to Germany to audition new singers and to visit his mother, now blind and alone, Handel returned to London in time to open the new season. Thereafter his operas flowed forth on the average of two per year. In spite of the quality of these operas, Italian opera grew ever less popular in London. In April 1737 Handel suffered a stroke. He recuperated during the summer at Aix-la-Chapelle, returning to London in time to start the next season. Finally, with the miserable failure of Imeneo (1740) and Deidamia (1741), he at last gave up and wrote no more new operas. Handel's ultimate failure with operas was offset by ever-increasing success with his oratorios. These provided a new vehicle, the possibilities of which he had begun to explore and experiment with nearly a decade earlier. Indeed these established a new vogue (fashion), in which Handel fared better with London audiences than he ever had with Italian opera. As if to test a possible market for dramatic compositions in English, Handel revived past operas with revisions to the oratorio style, meeting with much success. Producing oratorios was a profitable business. As a direct consequence, the oratorio became a regular feature of each season, with Handel leading the field, as he had done previously with Italian opera. It was obvious that the new form was on its way to becoming an established feature of English concert life. During the Lenten (the period of religious fasting for Christians) season in 1735, Handel gave no less than fourteen concerts, consisting mainly of oratorios. Handel's personal health, however, continued to falter. In 1751 total blindness set in. From that time on he was limited to revising earlier works with outside assistance, and to improvising on organ and harpsichord in public performances. Handel's accomplishment during the last creative decade of his life seems almost miraculous when the Italian cantatas, several concertos, and a variety of other works are added to his twenty major works. He died in London on April 14, 1759. Surveying Handel's entire creative life, one gains a sense of spontaneous (instinctive) and incredibly abundant creative flow. This is confirmed by the marvelous collections of his work preserved at the Fitzwilliam and British museums in England, which reveal not only the enormous bulk of his creative achievement but also something of his uncompromising critical judgment. There is scarcely a page without deletions; frequently, he struck out whole passages. He obviously knew the art of heavy pruning, and his works profited greatly from it. Handel's propensity to "write like the very devil" proved invaluable, in view of the demands imposed upon his time and energies in operatic composition throughout most of his career. Time after time he found it necessary to meet crises without much time for creative gestation (generation). Handel was at heart a dramatic composer for whom setting the scene and atmosphere and depiction of character thrust all other considerations into the background. Anderson, M. T. Handel, Who Knew What He Liked. Cambridge, MA: Candlewick Press, 2001. Keates, Jonathan. Handel, The Man and His Music. New York: St. Martin's Press, 1985. Lang, Paul Henry. George Frideric Handel. New York: W. W. Norton, 1966. Reprint, Mineola, NY: Dover Publications, 1996. Handel did not "ultimateely fail" at opera. He was phenomenally successful at opera, but the market changed and oratorio became more popular. Also, no biography of Handel should fail to discuss Messiah, his best known and most successful work.